We are happy to announce that last week saw the release of Wagtail 0.8.4. The release fixes several bugs. Most notably, page copies now have the correct fields and revisions. Matthew is working fully on 0.9. He is focusing on StreamField. Originally called TumblrField, StreamField is a new mechanism for freeform content inspired by 'Inline Panel', Sir Trevor and Tumblr. You follow the progress on Issue #823, read the StreamField specification and the StreamField block API. We are excited by StreamField and trust you will be too! As you may remember, we announced that Wagtail 0.9 will be the first release to drop Django 1.6 support. Several people tried the official Django upgrade tutorial, however the process is not as straightforward as we would like. We are looking at doing some work to make the transition easier. More details on Issue #671. There has been an increase in requests for MySQL support. While we use PostgreSQL at Torchbox and recommend it for Wagtail, we are delighted the community is helping move this forward. See issues #541 and #862. Further help on them is appreciated. 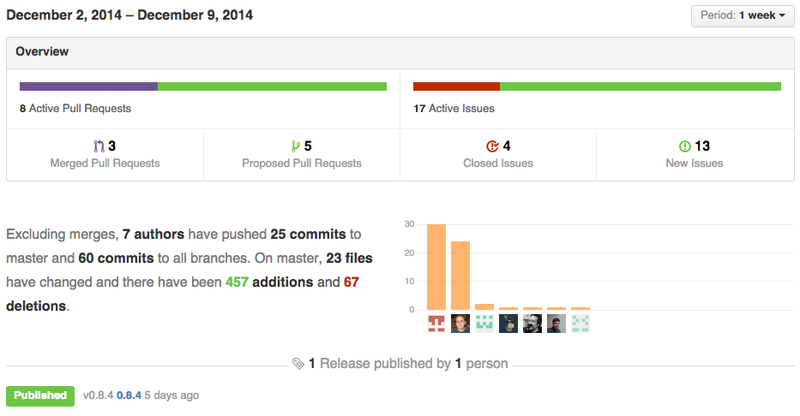 The project has received a number of very good Pull Requests. Please do include tests unless the change is trivial. This will enable us to review and merge the PR faster. Last, but not least, we continue to update and improve the wagtail-template project. This is our opinionated set of templates for Wagtail which contains best-practices accumulated throughout the many Django and more recently Wagtail projects done by Torchbox. One of the latest developments led by Karl is Docker support. As always, we welcome and are grateful for your contributions.